Hayward, WI (July 28, 2017) – There’s a new event series in town, just for kids. And, just like the popular obstacle courses out there for adults, this one is full of ways to scramble, climb, dodge, and jump your way through to the finish. “Dive for the Dirt” is a three-part series in August and September hosted by the Hayward Area Memorial Hospital and Water’s Edge (HAMH & WE) and powered by the Birkie. The full course will be unveiled at the Birkie Trail Run Festival on September 30, with a sneak preview of the obstacle course at the Hospital Trails on August 21. Plus, kids can try their luck on part of the obstacle course at Hayward’s Fall Fest. All three events are open and free to all youth ages six to 18. 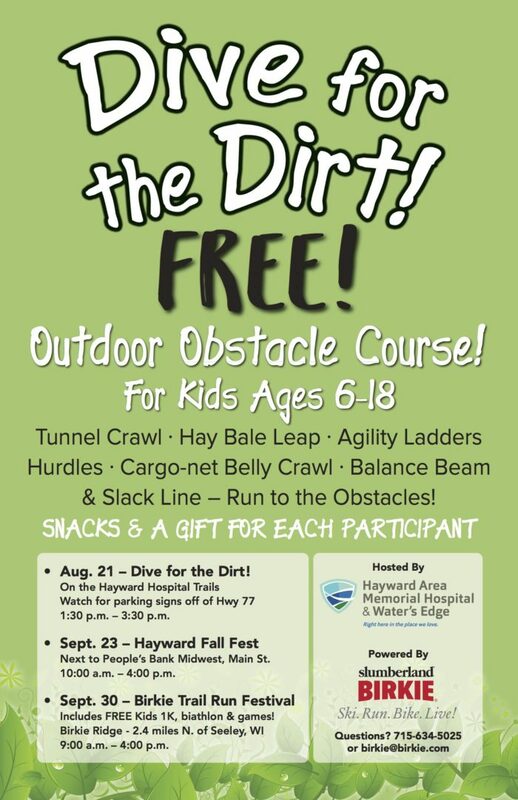 The Hayward Area Memorial Hospital and Waters Edge has teamed up with the Birkie for this obstacle course series as well as other youth and family activities throughout the year. From scavenger hunts to snowshoeing, hiking to running, it all takes place just minutes from downtown Hayward on the Hospital Trails. The “Dive for the Dirt” Kids series will include obstacles like a slack line, tunnel crawl, hay bale leap, balance beam, agility ladders, hurdles, and even a cargo net belly crawl at the final event in the series at the Birkie Trail Run Festival. At each event, Birkie and HAMH & WE staff will supervise and help the kids, as needed, throughout the obstacle course. Times: 1:30 p.m. – 3:30 p.m.
Times: 10:00 a.m. – 4:00 p.m. Note: This will be the full obstacle course event with other kids’ activities, too, including the Kids 1K, biathlon range, and games. Please contact the Birkie with any questions about this new collaborative program between the HAMH & WE and in support of the Hayward community. Call 715-634-5025, or email susan.kendrick@birkie.com. Located near Hayward and Cable, Wisconsin, the American Birkebeiner Ski Foundation, a 501(c)(3) organization, is known for its signature American Birkebeiner Ski Marathon held each February. Today, the Birkie brand has grown to encompass a year-round lifestyle that provides healthy, active events for thousands of outdoor fitness enthusiasts of all levels. From the iconic Birkie ski race and Birkie week of events, to the Lumberjack 5K Run/Walk, Birkie Trail Run Festival, and Fat Bike Birkie race, the ABSF and the Birkie Trail attract skiers, runners, bikers, trekkers, and hikers, from casual day-trippers to elite superstars. Birkie. Ski. Run. Bike. Live! Visit www.Birkie.com to learn more. Hayward Area Memorial Hospital & Water’s Edge are committed to their mission to continuously improve the health status of the people of the Hayward area. HAMH & WE is fiercely committed to creating a healthcare system that meets the unique needs of the people of the region. A system they can call their healthcare home. Hayward Area Memorial Hospital is a community critical access hospital providing outpatient and acute care. Water’s Edge serves the seniors of our community by providing independent and assisted living and long term care.